Twitter and the Blogosphere broke with the news today that the Twins had acquired Matt Rizzotti from the Phillies for "cash considerations". This move is in lieu of the minor leagues being one first baseman short now that Chris Parmelee is likely to break camp with the Twins due to his inspired play that's carried over since late last year. The bigger news however, is what's to come. At a press conference after the acquisition of Rizzotti, with reporters peppering Terry Ryan with questions about their latest acquisition, Ryan made a bold assertion: "When a team has holes, we will do anything in our power to help fill them. This isn't only true when it comes to minor league depth." This statement has been leading to wild speculation that the Twins might look to acquire middle infield help, bench depth, one or two starting pitchers, and some veteran arms for the bullpen. 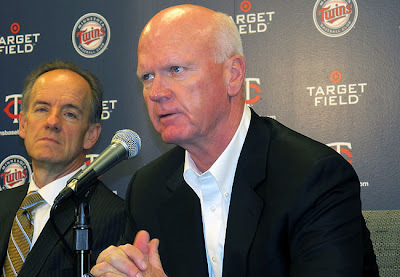 While this is a major breakthrough for the Twins front office -- that a player who can fill a needed position can be acquired for cash considerations -- some sources are criticizing the Twins for not coming to this realization earlier. Other players such as Edwin Jackson, Mark Buehrle, Todd Coffey and even Nick Punto could have been acquired for "cash considerations" (sometimes known as free agency) earlier in the offseason. When questioned about their tendency to not seek out players for cash in recent history, Ryan countered: "We've been exploring all the normal channels for acquiring players. All options such as waivers, the Rule 5 Draft, etc. have been utilized. Now that we see the simplicity of a cash acquisition, perhaps that could change our stance going forward, but let's take one step at a time." 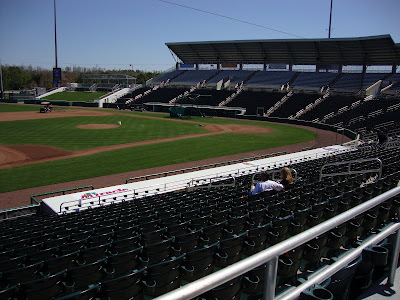 While the front office won't readily admit to being amendable to opening up the checkbook, word out of the other side of Fort Myers is that Twins scouts and personnel have been loitering around the Red Sox minor league fields with calculators and wads of one dollar bills, but that most of their players won't go near them without their agents present. The Twins front office has declined to comment on this. Well, nothing better than Spring Training to get me back here to write something. Despite arriving in Florida on Wednesday in time to head straight from the airport to catch the game against the Phillies, I decided to head down to Naples, get some Cuban food, and just relax on the beach instead. Since the Twins were out of town playing the Pirates, my day was just spent bouncing around from field to field watching exercises, fielding practice and BP. Not the same as a game of course, but for someone deprived of baseball for months on end it was like a dream come true. And with the team out on the road it's always nice to have the sports complex almost completely to yourself. 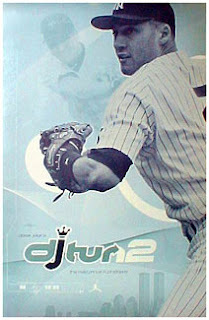 - The first thing that struck me was when I was watching Morneau take BP over on the main field near the Stadium. He was taking cuts in the same group as Willingham and Span. But the thing that I noticed was that he was wearing a batting helmet in BP. Not a huge surprise, I suppose, but considering the guys on the big league side of things tend to just wear hats in the cage, it struck me as a little odd. Down in the minors everyone was wearing helmets, but it seems like once you're in the bigs you get a little swagger and don't want to make your head any sweatier in the Florida sun than necessary. But fragility supersedes style. Morneau did have some powerful shots in his BP session, drilling a few back-to-back shots over the right field fence in one round and then in the next hitting a homerun on a rope, pure line drive (also to right). Willingham had as much pop as advertised as well, and not just when he was pulling the ball -- it seemed like for awhile he was trying to drive it and he ended up launching one way over the 405 ft. centerfield fence and high off the green backboard beyond. Morneau, Span, Hendricks, Willingham, and Carroll all took time to sign some autographs along the rail after their workout. Morneau didn't seem down, tired, lackluster or anything. He was laughing, joking, and making plenty of fun small talk with fans and if anything it was just good to see him in good spirits. - In complete contrast with Morneau was Nishioka. Relinquished to the backfields but still followed around by Ryo, Nishi just didn't look happy to be there at all. He kept to himself, he went through his drills, and as soon as fielding was over he went straight to the enclosed batting cages to take some swings instead of staying on the field with the rest of the team. I overheard Bruno say something to Gene Glynn about Nishi going inside and I couldn't tell if there was any subtext to it or not. Best not to read into it too much I suppose, but hard not to. - Watching Bruno run BP was great. He really has a great way with the players and they seemed to listen to him and actually respond to his instruction. In one instance, he was working with Aaron Bates and he stood in front of him, positioned his bat, adjusted Bates's hands, and gave him some direction on driving the ball. The next time he stepped into the cage he checked his hands and just drilled the next pitch. He spent time with everyone on that practice field, talking in Rene Rivera's ear while he was hitting, demonstrating adjustments for Ray Chang in his stance, etc. Later, Matt Carson was taking some hacks with Rene Tosoni and Joe Benson and Bruno was actually throwing the BP session. Carson took a strong swing at a pitch well over the far side of the plate and Bruno tsked him and said "Just because it's out there doesn't mean you need to be aggressive... stay back, wait for your pitch. Sit on the fastball in or wait for that hanging slider." Carson took the next pitch which Bruno tossed a little high and then Bruno hung one right over the heart of the plate and Carson belted it deep to the warning track with nodding approval from Bruno. - There was a lot of PFP going on today as always. There were 3 fields running, one of which I didn't spend much time at was the lower levels of the minors. There was one group of AAA pitchers working with Glynn, Bruno and Cuellar while another group that seemed like a mix of AAA and AA worked with Cliburn, Smith, and Hernandez. Wimmers was in Cliburn's group and seemed very at ease, which is a good sign that hopefully he's in for a good season. Steve Hirschfeld was also in that group and above everyone else he stuck out as a TALL pitcher, with long arms and a big frame. His minor league success isn't fluky it seems and he's definitely someone to keep an eye on as a future major leaguer. In the AAA group there were a ton of former non-roster invitees (PJ Walters, Brendan Wise, Daryl Thompson, etc.) along with some familiar faces like Scott Diamond and Jeff Manship. One guy in particular it was pretty great to see on the field: Kyle Gibson. While the other pitchers would throw a live ball in the drills he just mimed the action, but still went through the routines. Hopefully he can make it back to throwing soon. Gibson's wife was there as well, along with their adorable Alaskan Malamute (who must have been baking in the sun). Their puppy got a lot of attention from the players as they ran to the field. I think I heard Tyler Robertson saying something about how he'd be their mascot for later in the game and a bunch of the other guys chuckled. - Pedro Florimon was fun to watch as he took practice. He was pretty smooth with the glove in the field and has a decent size that I imagine could generate some line drive power if he makes more contact with the bat. He's also got a very easy going nature, very jovial. Glynn told him he'd be playing shortstop in the game today and he smiled and shook his head and said "No, no, segundo," which drew some laughs. - Smith threw some BP to a group that included Aaron Hicks, Marc Dolenc, Evan Bigley and Darin Mastroianni. He went through a few rounds and then began going through situations with them, telling them to drive one shot to left, followed by center, followed by right. If someone could get all three to the right direction he'd give them a bonus situation. Hicks really seemed to struggle with directional hitting and wasn't getting good cuts. Mastroianni actually nailed all 3 and so Smith called out a bonus situation for him: "Bases loaded, 2 outs, take a shot" and Mastroianni proceeded to lay down a bunt and sprinted out of the batting cage which seemed to amuse everyone on the field. - As great as it was watching Bruno teaching the AAA players about their hitting, it was fun to watch Paul Molitor and Tom Kelly strolling between the 3 active fields and jumping in to offer pieces of advice, or sitting down on a bench or a folding chair and taking in some of the practice. When everyone finally broke to go in for lunch before their minor league games that afternoon, I wandered by the little half field near the clubhouse and saw Molitor hitting grounders to Mastroianni -- who for some reason was getting reps at second base -- to practice ranging to his left and ranging to his right while Molitor would shout out advice between each grounder. Eventually TK and James Beresford wandered by as well and Beresford asked if he could join, so TK ended up shooting the grounders and Molitor stood by the two of them and gave them some pointers. That's about all I can remember from my sensory overload today. I'm going to the Twins/Red Sox game Friday and I'll also catch the game against the Pirates on Saturday. If anyone else is going to some of the games feel free to shoot me an e-mail or leave a comment and maybe I'll see you there! Are live this morn with sound of bat and glove. As sunlight and hope stream from skies above. As prospects show early to prep for the farm. The spring is here and summer can't be far. Soon mascots, organs and anthems will sing. To see teams begins the quest for a ring. It's time to enjoy the beauty of ball. I've always loved baseball. And I've always liked women. When the two meet, it's great. To be fair, even though I was always a Twins fan when I lived in Minnesota, I never became such a die-hard fan until I moved to New York and was separated from my team. Baseball was always great, but I think I took for granted being so close to my team and being able to have them anytime I wanted. The same goes for relationships I suppose, but its first evidence in my life was made plain in baseball. My girlfriends when I lived in Minnesota were never really baseball fans (perhaps that's why they never worked out), but since I've moved to New York I've either sought out Twins fans or converted them. Yes, converted them. Or at least attempted to. 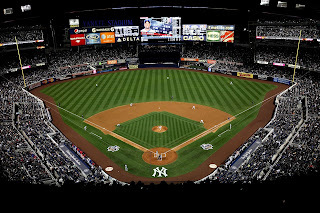 For example, my first serious girlfriend in New York was not really into baseball at all. A New York art student, Floridian, vegetarian, nothing really conducive to baseball. But in order to make things work, much to her credit, she actually attempted to adopt my team and develop an interest in the game. Early on I went out and bought a Joe Nathan t-shirt jersey in men's small and gave it to her saying it was my old shirt I'd grown out of. Nathan however did NOT become her favorite player. Despite his lovable facial twitches and being the best closer in Twins history, no, she fell instead for Torii Hunter. Torii was an easy player to love I suppose. And it didn't hurt that when we went to a game at Yankee Stadium, her first Twins game, Torii belted a go-ahead homerun in his first at bat and she stood up cheering and said "I think I like HIM!" Her Torii Hunter connection was furthered later when she found out that her favorite place to eat in Minnesota, The Original Pancake House, was also Hunter's. It didn't matter, she liked the Twins, she was hooked. Pick any player she wanted, I'd finally found a Twins fan in New York. 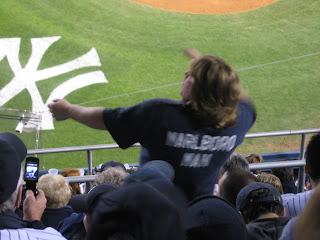 At the time, my roommate was a Detroit Tigers fan. My girlfriend spent a lot of time at my apartment and her proximity to the two of us probably forced her to get into baseball more than she otherwise would have. After awhile she told me that she didn't like watching baseball with me because if we lost I'd be upset the rest of the day and act really depressed. But she pressed on, still watching baseball and sometimes falling asleep in extra innings, sometimes awake enough to celebrate 9th inning walk offs. But the real test was on the last day of the season when the Twins won and she actually encouraged me to switch channels and start cheering for the Royals to beat the Tigers to see if we could make the post-season. We did. Of course. And my roommate came home upset and she got her first taste of gloating. But I know she's not a baseball fan anymore. Perhaps that means she never really was. Perhaps the departure of Torii Hunter doomed the relationship and to be a true Twins fan you need to be in love with the team and not just a particular player. Life's eternal questions. I later started dating another girl for awhile. She was an avid sports fan from Arizona, but primarily baseball and basketball. This was my first taste in starting to cheer for the teams of a girl that I liked. While the Timberwolves and Vikings floundered and the Gophers were in the middle of a stretch of nonexistence that they're still in now, I started learning reasons to like Steve Nash and found out what a Sun Devil was. Since the Diamondbacks weren't much of a team she conceded to me on the baseball front and went out to buy a Justin Morneau jersey on her own accord. But this relationship didn't even survive an offseason. It was short, and baseball never really even got it's chance. We never went to a game together, which is the first sign (although to be fair there was never really an opportunity). My last girlfriend was a bit of an enigma. She was Polish, and trying to learn about baseball from a slew of Giants fan friends in the year they won the World Series. Our first date was bringing her to a Twins game at Yankee Stadium for a game that got rained out. I was excited because there was someone I liked that genuinely wanted to learn about baseball before meeting me but had no strong allegiance to any team in particular. I got great seats, close to the field (and to Danny Valencia, thinking that he'd be a good introduction for any girl to start liking baseball), but as the skies opened and the game was rescheduled until September, we left the ballpark and settled for dinner instead. She genuinely started getting into the game, learning how to read balls and strikes, the different between catching fly balls and force-outs, even the hard to grasp rule of tagging up before advancing on a caught fly ball. I made the trip up to Boston to catch the Twins at Fenway and she joined me. Despite another gloomy and rainy day we got to watch our first live baseball game together, and although the Twins lost she started feeling an affinity for Jason Kubel, the only player on our team worth caring about in a season of disappointment. I sometimes wonder how someone could go from cheering for a World Series winner to one of the worst teams in baseball within the span of a year, but she did it admirably. 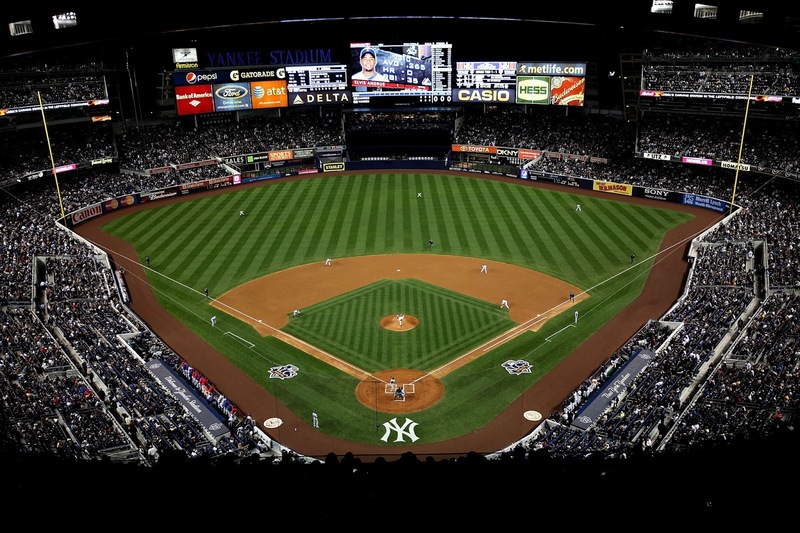 We spent the summer watching games at the bar or on a hacked MLB.TV account. We caught Liriano's no-hitter, went out of our way to see the Twins play the Giants, and even flew out to see some games at Target Field; but the moment I knew she liked the Twins was when she started referring to them as "us" and "we". Finally, a girl who got it beyond superficial cheering. But when September rolled around we couldn't catch that rain-out game and gave the tickets to some friends. Kubel seemed destined for departure despite her autographed Kubel baseball and her new Kubel T-shirt, and he ended up making his way to the Diamondbacks early in the off-season (talk about painful for someone who likes the Giants). Looking back on things I'm not sure if it's right to convert people you like into fans or your team, or if it's even truly possible. Perhaps it does more harm than good. I think you either meet a Twins fan or you accept that the person you love is a fan of another team and learn to live with the differences. I've had the pleasure of getting to know The Geek and The Voice of Reason, and reading the story he publishes every year and seeing the two of them together makes me realize that you can love your team and you can love your person and you don't need to force the two of them together -- it will happen naturally or it won't happen at all. But as Valentine's Day rolls around today -- and Happy Valentine's Day to everyone -- I'm not looking to create any new Twins fans. I'm counting down the days until my lifelong true love returns. 5. 5 more days. 5 more days until we're back at baseball. That's the best Valentine's Day gift ever. When Ron Gardenhire announced his projected opening day lineup I don't think there were any surprises, at least not personally. However, not playing coy and announcing to the world before any of them have stepped foot on Hammond Field to take a few warmup swings seems either a little presumptuous or a devilish attempt at lighting a fire under some fringe players. Personally, it just seems a little deflating. It's hard right now to imagine Willingham and Doumit's impact having never seen them suit up for the Twins, and truth be told I never really payed all that much attention to them before their names starting popping up as possibilities for the Twins. 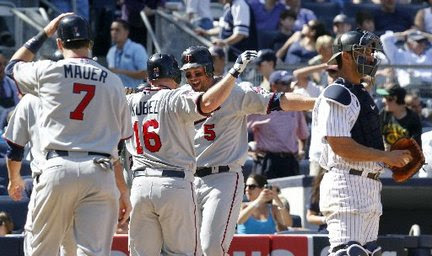 Regardless of how well their bats might play I think it's pretty clear that the 2012 Twins will lack the thump we got a little taste of back when JJ Hardy was batting ninth and Thome was tapping his foot on the bench waiting to mash some taters. Instead, this is throwing me back to the days when Nick Punto was dirtying up his uniform by sliding headfirst into first base, Jason Tyner was locking down the DH spot, and Luis Castillo was burning his prosthetic knees up the first base line after laying down a bunt for a hit. The top and bottom two spots of the lineup will be a typical return to Piranha fashion, with that injection of speed that we heard about last year but never really got to see. Leadoff and the two-hole being filled with Denard Span and Jamey Carroll makes decent sense, as both have relatively strong on base skills and once they get on they can hopefully run a little bit. Of course both are somewhat of a question mark as it remains to be seen if Span will return healthy and if Carroll can stave off his aging long enough to play a few more years. At the bottom of the lineup we're rounded out with the ever-enigmatic Alexi Casilla and then Ben Revere. If either can post a decent OBP the four of these hitters going back-to-back could be enough to to scrap together some typical Piranha runs late in a ballgame. But of course this relies on us seeing the "good" version of Casilla and on Revere improving on his performance at the plate from last year -- neither of which are sure bets. The other factor to watch will be how the Piranha approach works for the Twins in their new ballpark. Without the aid of the turf in the infield helping them get some seeing-eye singles, the four new Piranhas will have to rely a little heavier on line drives to the gaps to show off their wheels (unless of course they're playing the Tigers and can just lay down bunts up either line). Regardless, it seems like the Twins are committed to adjusting their offensive approach in Target Field. Going back to what worked for them throughout the middle of last decade. It will be interesting to see if it pays off, because I'm still a little puzzled why they ever changed direction from the 2010 Minnesota Murderer's Row that posted one of the best records the Twins have had in recent history their first year at the new ballpark. Hopefully this year helps them decide if they pursue the small-ball approach they seem set on or else start looking for some power bats again. *In other news, if you haven't already, please go support Twins maven Lindsay Guentzel in her quest to live in the MLB Fan Cave! I had the pleasure of attending an event there last year and walk by it almost every day as it's down the street from my work. It would be great to have a fellow Twins fan over there and if anyone from our online Twins community deserves it it's definitely Lindsay -- who has made herself omnipresent in the Minnesota sports world. Let me take a moment to welcome myself back. Welcome myself back from what however, I'm not sure. Laziness? Lack of inspiration? Busy personal life? Probably all of the above. One thing is certain and that it's hard to maintain an interest in blogging while your team goes through an endless stretch of ineptitude. That's no excuse though as many excellent bloggers out there continued to write throughout the season (and the lifeless offseason) and my appetite for anything baseball has taken complete advantage of being able to read them every day. It's tough to know how to get back into this. I'm sure I've lost many loyal readers, and I'm sure Curve's link has been removed from many other blog sidebars. For anyone interested, I'm going to find a way back to writing, but at this point it has to be more for myself than anyone else I suppose. For anyone who does it on a regular basis, writing is a muscle that needs to constantly be exercised (trite, cliché, eye-rolling everywhere). And if nothing else I hate having that muscle out of shape. So let's start out slow, disjointed -- the only way to ease back into the tepid water I'm facing. - I already miss Michael Cuddyer, Joe Nathan, and Jason Kubel. Losing one after the other in succession felt like saying good-bye to best friends. I realize it would have been a mistake to resign them (although I still think losing Kubel is a tough pill to swallow). Doumit should fill in nicely, and Carroll will probably at least be decent, which is a sure step-up from anything we've seen in the middle infield except JJ Hardy. But this is a stopgap, and I'm sure the front office sees it the same way. - Our bullpen is a hot mess. I thought we tried the same plan last year -- throw a bunch of arms at a wall and see which ones stick. The real problem here isn't that we're not going out and signing solid relievers, that rarely ever works out for teams (e.g. Soriano, Cruz, Rodney, etc. etc.). The real problem for me is that the young talent in our farm season either hasn't risen fast enough or isn't there. I think we'll have a very good idea of if Burnett is for real or not after this season. Why Gutierrez, Bromberg, Manship, Waldrop, or Slama are not viable options for us at this point is beyond me. If we don't believe they'll step up, I can understand roster positions going to people like Phil Dumatrait, Casey Fien, Jeff Gray or people of that ilk, but then the bigger question becomes why aren't we producing our homegrown talent like we were before? - Tom Kelly's jersey being retired is a classy classy move. That man will forever live in my heart as being the guy that brought World Series titles to Minnesota and it was a sad day when he hung up the clipboard. Not to take anything away from Ron Gardenhire but he has a large shadow of a small man hanging over him. Gardy certainly has some of Kelly's attributes, but the silent effectiveness of TK is something I've always admired. Well done, sir.